If you’re a true fashionista, you know that fashion isn’t just about clothing; being the epitome of style applies to every choice you make in life, up to and including your website design. While anyone can take a simple WordPress theme and build a website around it, you’ll want to stand out from the pack with a WordPress theme that not only plays to your strengths but makes you the total envy of other fashion bloggers. These 29 WordPress themes not only invoke your sense of style, but they’re also packed full of features that will help rocket your site to the top of the Alexa rankings as well as giving you user friendly ways of adding in display ads t help you monetize your blog. Whether you’re covering the new fashions out of Paris or your own style right from your living room, you’re sure to find at least one WordPress theme on this list that is a perfect fit. With its hip, modern look, the Cartagena WordPress theme is an excellent fit for fashion bloggers who blog and sell the latest in modern trends. In addition to a storefront, this WordPress theme also features a blog page so you keep your customers in the loop when it comes to your store and the fashion world at large. The portfolio page lets you show off your credentials while the ability to use threaded comments gives your readers a voice on both your blog articles and your items for sale. The Cartagena WordPress theme includes five different layouts, giving users the ability to try out different designs and see which one fits their website the best. Fashion is always changing, with new styles appearing almost every day; with the Zackas WordPress template, you can change your site nearly as much as your style! With 18 HTML templates and four different home page styles to choose from, you’ll have plenty of options to choose from for your website. No matter which model you choose, each one will work flawlessly on both mobile devices and PCs along with all of the major Internet browsers. As an extra bonus, the Zackas WordPress theme also includes Google Fonts, giving you just as many options for your fonts as you have with the design of your site. 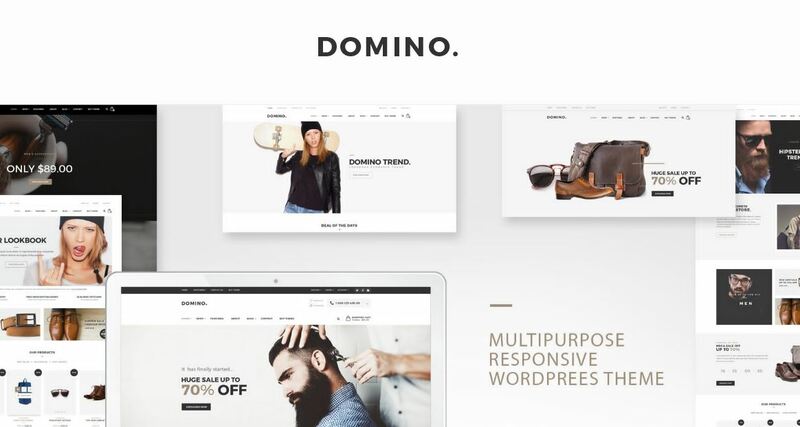 The Domino WordPress theme has a lot of similar ties with the Karan WordPress theme; however, upon closer inspection, the Domino WordPress theme does have some features of its own that fashion bloggers will love. In addition to a dedicated blog space, the Domino WordPress theme also includes social media integration so your readers can share your posts and store items with their Facebook and Instagram followers. The Domino WordPress theme is also an excellent choice for beginners thanks to the copious amount of documentation it comes with; no matter what question you may have, you’ll find your answer in the included manuals. 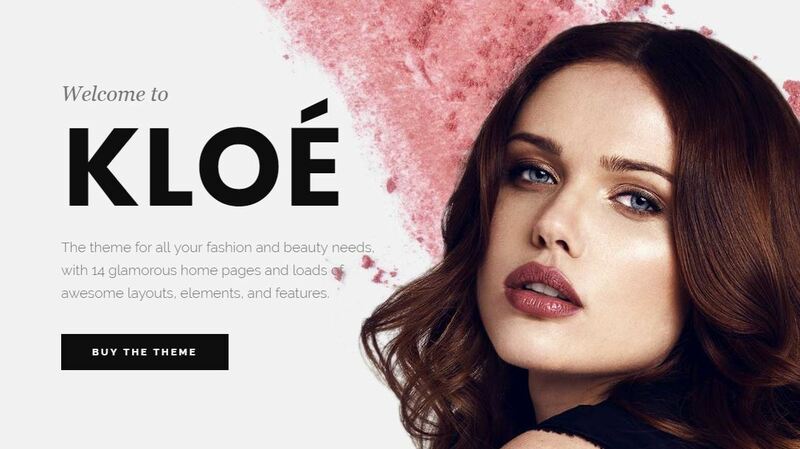 The Kloe WordPress theme is a multipurpose fashion theme that accommodates a broad range of fashion blogs. While this WordPress theme can act as a storefront, you can also use it as a portfolio for your modeling work or even use it to blog about trends in the fashion world. The ability to center your blog posts guarantees that the eyes of your readers will be directly on your posts at all times. The Kloe WordPress theme is a stellar choice for beginners as it requires no coding while still giving users plenty of customization options, such as custom headers and footers. With the tagline of “start blogging in style,” the Allure WordPress theme features everything you need to create one stylish WordPress site. This three-column WordPress theme lets you fit a plethora of information onto one page while the social media integration allows your readers to post their favorite articles to a website like Instagram. The custom post formats let you switch up your blog posts between the written word, video and audio. This theme is also translation ready, giving your fashion blog the potential to reach a global audience. 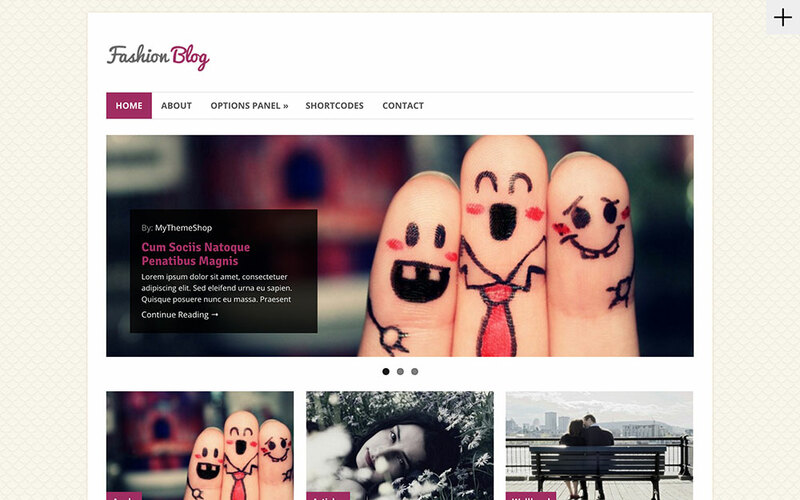 With over 30 blog styles to choose from, no two Faxion WordPress themes will look alike. The responsive design of the Faxion WordPress theme means it will look and function great on both mobile devices and PCs. This theme also supports WooCommerce, meaning you can turn your blog into a storefront in just a few clicks. While this theme uses a hefty amount of code, it includes numerous comments within the code, so you know exactly what you’re modifying. Like most WordPress themes revolving around Fashion, the Faxion WordPress theme features social media integration to websites like Facebook and Pinterest. One of the worst things that can happen when customizing your WordPress template is making changes and having your whole website come to a screeching halt because of a poorly implemented change. With the Waylard WordPress fashion theme, this worry is a thing of the past thanks to the preview mode, which lets you view all changes to your site before they go live. The Waylard WordPress theme is also SEO friendly, meaning your fashion blog will quickly climb the ranks of the main search engines, including both Google and Bing. With its trendy parallax feature, the Fashion Spot WordPress theme instantly stands out from the crowd the minute your readers load your site. After you’ve hooked them with how great your fashion blog looks, they’ll stay on your page due to fantastic features such as a sticky menu, a responsive design, a contact form and Google Maps integration. The Fashion Spot WordPress theme also supports all the major browsers; no matter what browser or device your readers use, they will get the same great experience guaranteed. If you’re a WordPress novice, the Fashion Spot WordPress theme also features detailed documentation that goes over every aspect of the theme. Both WordPress beginners and experts alike will love how easy it is to use the Kustric WordPress theme, primarily due to the number of shortcodes this theme packs. The included premium widgets will give your fashion blog an advantage over your competition while your site will rocket to the top of Google thanks to the SEO-friendly code. The vast library of Google Fonts included with the Kustrix WordPress theme will let you choose a font that matches your fashion taste. In the event that you ever run into a snag that you can’t fix on your own, the developers behind the Kustix WordPress theme offer 24/7 support, letting you get your website back in action in no time flat. With support for both parallax and retina screens, the Supreme WordPress theme is quite possibly one of the most fashionable WordPress themes on this list. Readers who visit your site on an iPad or iPhone will find themselves treated to a beautiful looking website that they will want to stay on for hours! With the ability to add background videos to your site, your fashion blog will stand out from the other blogs that just use static pictures as a background. The MotoPress Editor makes customizing your website as simple as dragging and dropping, making the Supreme WordPress theme an excellent theme for a novice WordPress user. If your fashion blog is of a more sensual nature, then you’ll love the Refined Lingerie WordPress theme. This theme features softer colors and more rounded edges in its design, creating a perfect match for lingerie photos and blog posts. This theme is fully editable, with users able to customize every inch of it, including the headers, footers and menus. The theme is multilingual ready, letting you branch out and reach audiences as far away as China and Germany! The Refined Lingerie WordPress theme also includes over 80 shortcodes, making customization a quick and painless affair. The Wildfire WordPress theme is a traditional theme that relies on copious amounts of white space so that your blog posts and pictures are the highlights. The theme also uses a minimalist design so that the eyes of your readers stay on your blog posts rather than wandering around the page. The included Options Panel lets you easily configure almost every aspect of the Wildfire WordPress theme while the added widgets let you customize your fashion blog even further. The unlimited color schemes found in the WildFire fashion blog let you mix and match any number of colors to create the perfect color combination. 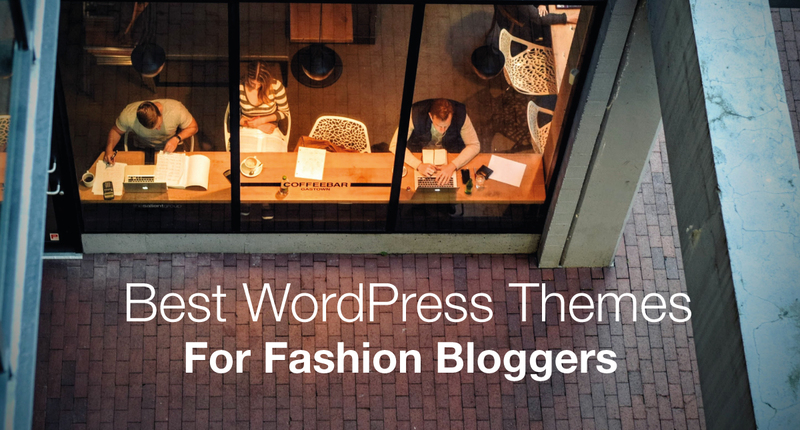 Thanks to its crisp design and unlimited color scheme, the aptly named FashionBlog WordPress theme is an excellent choice for both novice and veteran fashion bloggers. The related posts feature ensures that your readers stay on your website by recommending additional blog posts at the bottom of the current one. No matter what device your viewers use to check out your site, the FashionBlog theme will adjust itself accordingly to their devices. The FashionBlog WordPress theme features a premium support option so no matter how badly you bungle the code, the support team is there to get you back on track. With its wide range of available options, the eCommerce WordPress theme is surprisingly useful for fashion bloggers. Each of the default layouts is designed to show off and sell fashionable products with the help of built-in features like SEO and speed optimization. The eCommerce WordPress theme features a fluid design made to look beautiful no matter what device a reader uses, and it’s even compatible with many easy-to-install WordPress plugins. In addition, fashion bloggers with an affiliate network can rapidly set up products within this template, including the sale of digital products. Finally, you’ll never worry again about having enough featured products; this theme supports unlimited front page categories. One of the goals for fashion bloggers is to reach as broad of an audience as possible and the Fashionbuzz WordPress theme can help you do just that. This theme is specially designed for both mobile and PC users so no matter what platform your reader uses, they will have lightning fast load times. This theme is also cross-browser compatible, supporting browsers such as Internet Explorer, Firefox, Chrome and even Opera. The ability to support threaded comments gives your readers a voice, letting them comment on your articles in addition to talking with each other. As you’d expect with a name like fFashion, this WordPress theme caters to nearly every genre of fashion blogging, including fashion models, clothes, magazines and just a standard catch-all fashion blog. With social icons located directly in the header, your readers can share their favorite articles on a multitude of social media platforms, such as major platforms like Facebook, Twitter and Instagram to niche platforms such as Flickr and Vine. 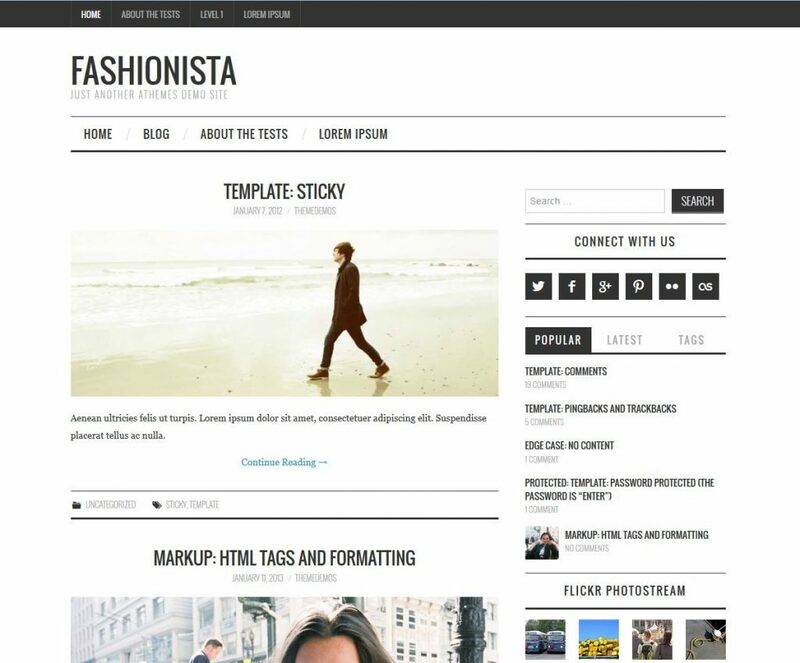 The fFashion WordPress theme is fully integrated with the FontAwesome widget, giving you access to unique fonts that will make your website truly stand out from the crowd. The ability to customize nearly every aspect of the theme, such as the header, footer and menus, lets you build the fashion blog you’ve always dreamed about. Magazine-style blogs are all the rage right now and with the Fashionista WordPress theme, you’ll be able to create a blog that rivals even the hottest fashion magazines. Created using Bootstrap, this elegant theme allows you to lay out your website similar to a magazine, giving your reader a sense of familiarity as they browse your site. Unlike with a magazine, the ability to leave comments gives your readers a chance to be immediately heard while the two-column layout lets you pack more information onto every blog article. 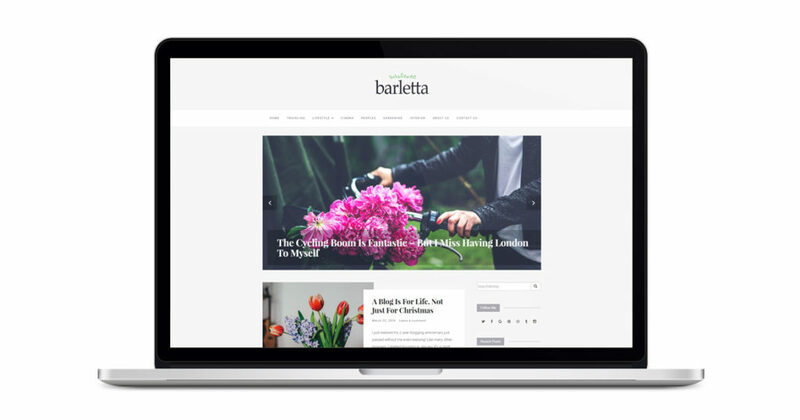 If you’re looking for a minimalist WordPress theme that is also fully responsive, then you’ll want to check out the Barletta WordPress theme. While fashion bloggers will love the simplistic look and feel of this theme, it also works perfectly for foodies and travel bloggers as well! The Bootstrap framework is easy to use and makes this theme an excellent choice for beginners while WordPress veterans will love the advanced options found in the theme. In addition to right and left sidebars, the Barletta WordPress theme also features threaded comments, a two-column layout, custom backgrounds and menus and even featured images. If you want your words and pictures to be the highlight of your fashion blog, a minimalist WordPress theme like Barletta is an excellent choice. If you’re making a transition from fashion blogger to fashion entrepreneur, then you’ll need a WordPress theme like Alpha Store. This WordPress theme features an eye-catching design that will entice your reader to check out your fashions and a responsive layout that is perfect for both PCs and mobile devices alike. The WooCommerce widget is integrated into the heart of this theme and the ability to add custom logos and backgrounds allow you to make the Alpha Store WordPress theme your own. This theme is perfect for beginners thanks to its drag-and-drop interface; if you know how to use a mouse, you’ll be able to successfully use this theme. 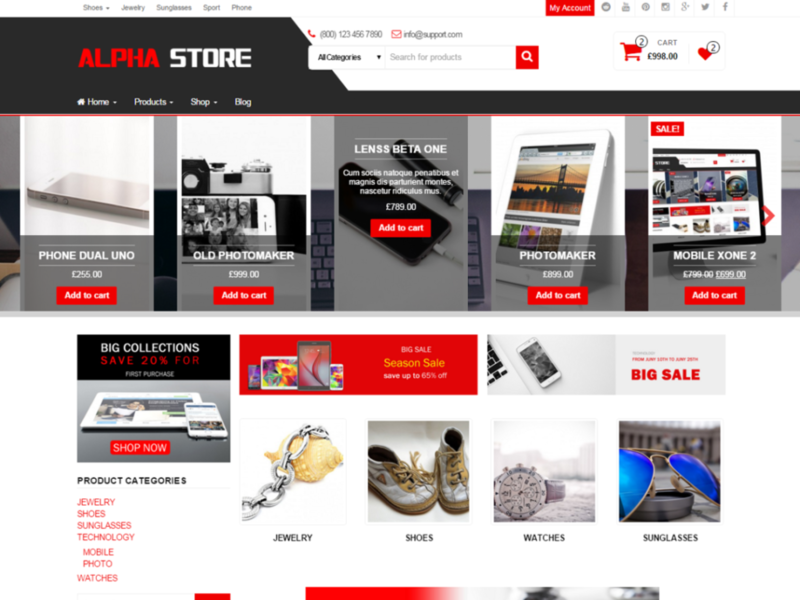 Another highlight that novices are sure to love is the Alpha Store WordPress theme requires absolutely no coding! 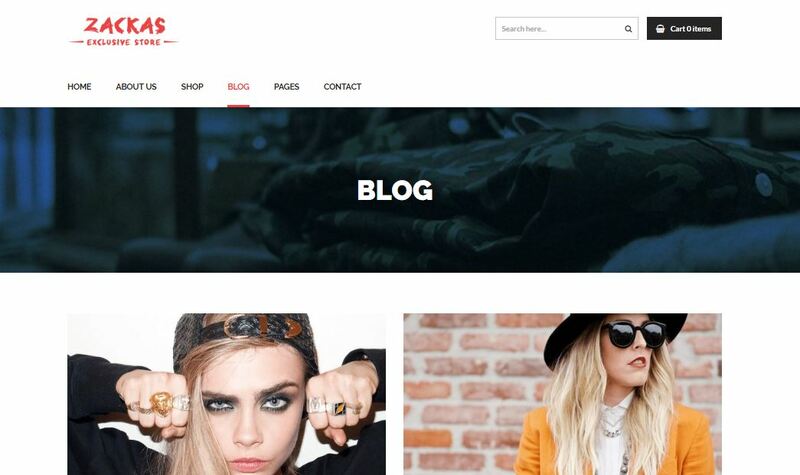 While the Alpha Store WordPress theme makes a great store for a multitude of bloggers, if you’re looking for a storefront theme geared entirely towards fashion then the FashStore WordPress theme fits the bill. FashStore’s layout works perfectly for showcasing your items, whether it’s men’s clothing, women’s clothing, shoes or even accessories such as bracelets and glasses. The FashStore WordPress theme features a large degree of customization, including letting users change the background and colors. The three-column layout of the FashSore WordPress theme means you can fit more fashion items on each page, potentially gaining more sales from your shoppers. 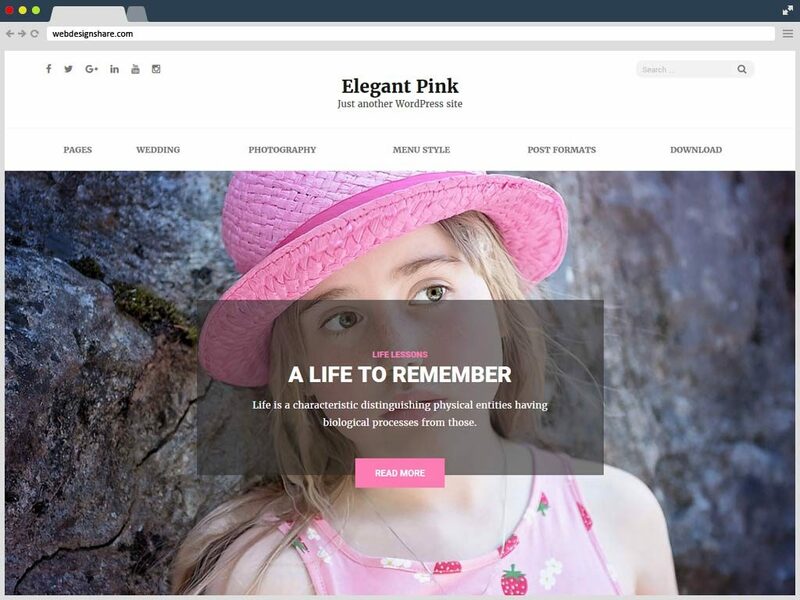 Described as a “feminine and girly” WordPress theme by the developer, the Elegant Pink WordPress theme is ideal for fashion bloggers who focus on fashion items for women. Despite the name having pink in the title, you’re not limited to using only pink colors with this theme; the Elegant Pink WordPress theme gives the user complete customization over elements such as the color scheme, the menus, the headers and the footers. The Infinite Scroll feature lets your readers load up one blog post after another, keeping them on your site longer than other WordPress themes. The Elegant Pink WordPress theme’s masonry layout places elements of your fashion blog in optimal positions so that your reader can easily locate them. The theme is also SEO friendly, meaning your fashion blog will quickly rocket to the top of Google and Bing. While most fashion bloggers tend to cover the world of fashion as a whole, some will choose to focus on a niche part of fashion, such as weddings or fashion styles for babies. 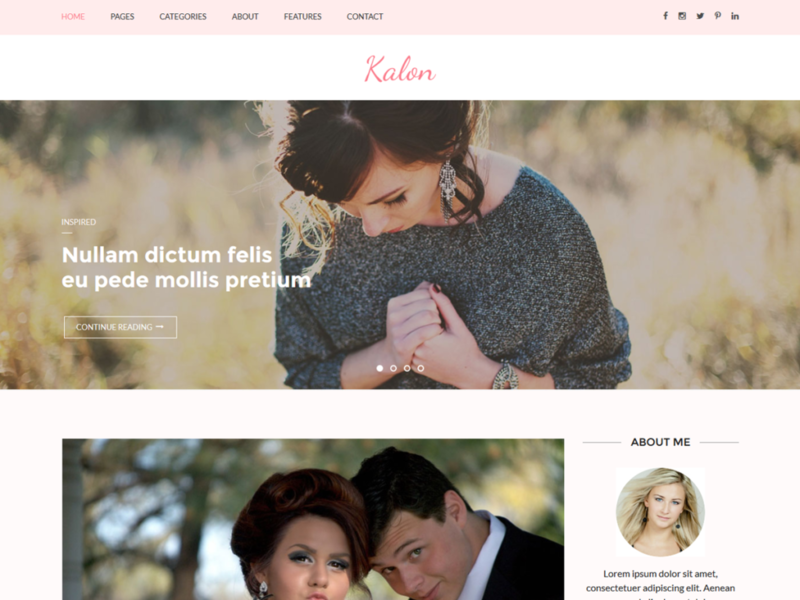 For those bloggers, the Kalon WordPress theme is an excellent choice as it provides a minimal, clean look that is a perfect match for events such as weddings. This theme is also a fantastic choice for the WordPress novice as the easy-to-use Option Panel distills even advanced WordPress features into easy-to-use terms. This theme also features social media integration so your readers can post their favorite blog posts to sites such as Facebook, Twitter and Google+. 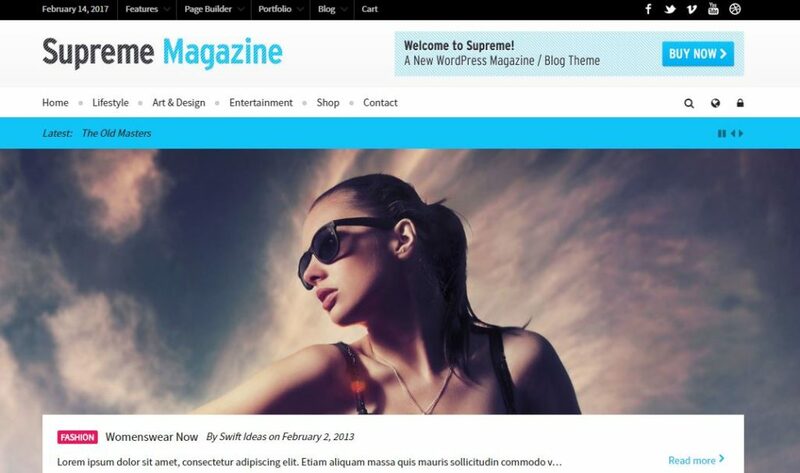 Like the Minimal WordPress theme, the Tuto WordPress theme is designed to replicate the look of a fashion magazine. 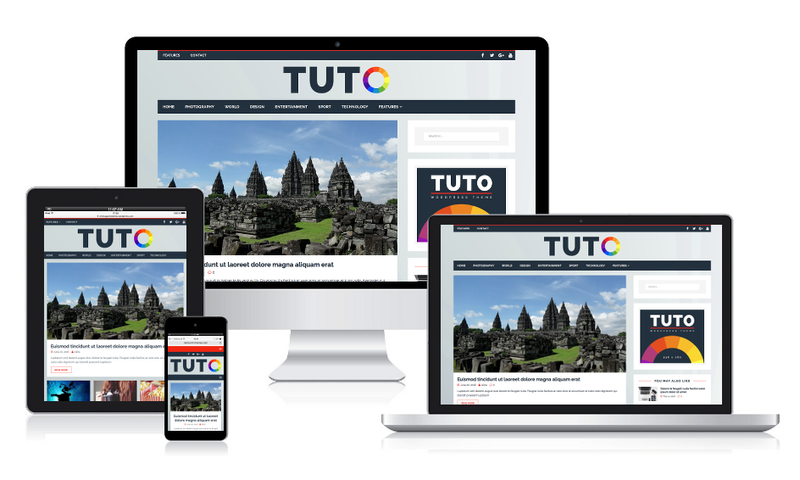 Like other themes, the Tuto WordPress theme is both fully responsive and works great on both mobile devices and PCs alike. What makes this theme stand out is the way it organizes your content, displaying it in such a way that it both highlights your blog posts and makes them easy for readers to find. To really make your posts stand out, this theme allows you to use both animations and CSS3 effects in the body of a post. If you’re one of those users who likes to tinker under the hood of their theme, you’ll find a wide array of customization options such as multiple sidebar positions, two different layouts and the ability to use custom widgets. Fashion is about staying on the cutting edge, and the Braxton WordPress theme allows your website to be just as fashionable as the styles you cover. This retina-ready WordPress theme makes your site look fantastic on both desktop computers and mobile devices like the iPhone or iPad. Four different ad units allow you to monetize your fashion website while an infinite scroll feature lets your viewers see everything your site has to offer. 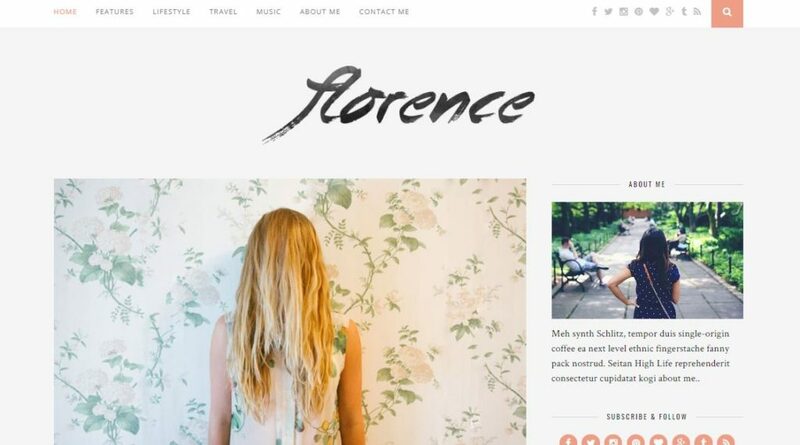 Florence is an elegant, sleek WordPress theme that is perfect for covering the fashion involving fancy galas and high society gatherings. Florence includes everything you’d want on a WordPress theme, such as sidebar options, multiple layouts to choose from and sidebar widgets. If you have any questions about using this theme, the developer provides a high-quality level of customer service with 24-hour response times. Physical magazines are on the way out, but digital magazines are stronger than ever. The Voux WordPress theme allows you to create a website that rivals even the best classic magazines of the fashion world. The included Visual Composer software allows you to create a unique look for your site in a matter of minutes. Voux also includes social media sharing options, letting your readers share their favorite looks to friends and family on Facebook, Twitter and more. SwagMag offers something that no other WordPress theme can: The ability to create multiple mini-sites within your main site. This feature allows you to post more content than the competition while keeping your site easy to navigate for your users. The developer of SwagMag ensures that this function results in your viewers not only staying on the site longer but clicking more content. 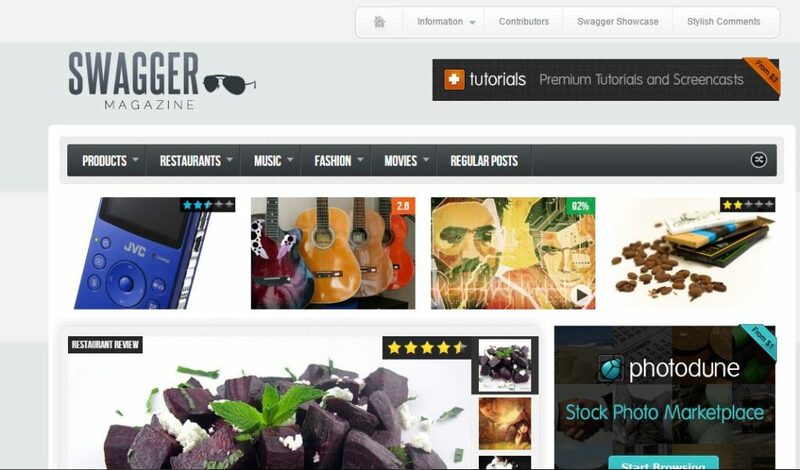 SwagMag works ideal for a website centered on fashion reviews, with the theme providing an almost unlimited amount of options to present your reviews. Whether you’re building a website to sell your fashion or making a website to cover it, Valenti is the perfect WordPress theme for you. Valenti uses a custom menu system allowing you to create elegant drop-down menus. The built-in review system allows your customers to review and score their favorite items. Valenti also provides features such as sticky sidebars, multiple blog styles and improved performance. It also supports widgets such as WooCommerce and bbPress. 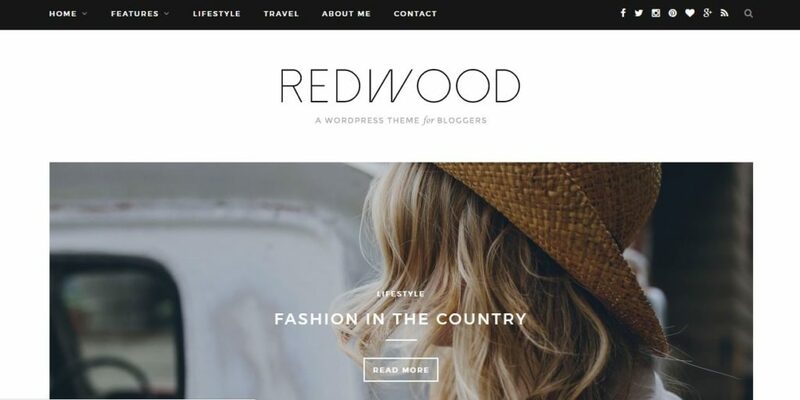 Redwood is a WordPress theme designed with the blogger in mind. This theme features five different blog layouts, ensuring that two users both using the Redwood theme can have completely different websites. Redwood features full integration with Instagram, making this theme a perfect choice for a blog centered around fashion photos. In addition to written posts, you can also add video posts, gallery posts and even music posts to your blog. Lastly, you can customize nearly any part of this WordPress theme, including the headers, footers and social media features. KLOE – the excellent theme with stunning look, I really like it and this is the best theme for fashion and beauty blogs or websites. This one has 14 glamorous home pages and loads of awesome layouts, elements and features. One of my customer using this stunning design…..